We gather in the morning, a bunch of us in green Nomex pants and tough fire boots. Most of us wear ball caps and sunglasses to shade our eyes. Along with the yellow shirt, this is the signature uniform of wildland firefighters off the fireline. The guys in charge of the project outline the objectives and the plan. Safety, communications, logistics are discussed. Everybody knows where they fit into the big picture. I offer to do weather and be a lookout, and am happy when that proposal is accepted. Oh boy. Prescribed burning! There are lots of legitimate reasons to light fires in the woods: to reduce the amount of logging slash (tree limbs and tops) and create spaces for tree planting; to reduce fire danger; to stimulate plant growth. These days, there’s real concern about the intensity of wildfires because 100 years of fire suppression has changed the composition of western forests. Tree growth is dense, species have shifted to trees that are less well-adapted to fires, and it’s possible that climate change affects the overall health of forests. Around here, trees are stressed by an outbreak of spruce budworm that has lasted over 10 years. And to complicate matters, more people have homes in the woods. Firefighters have noticed a change in fire behavior over the years. Fires are more intense and less predictable. The objective of our burning project is to reduce ground fuels in a recently logged area. There are homes on private property all around. It’s better to burn in May when the soil retains moisture and before the vegetation and slash dries even more. A specific burn plan has been written and approved. No flame touches the ground until all parameters are in alignment. The desired outcome is a forest that is more fire-resistant. I have a map of the burn unit, and drive around until I have my bearings. Then I park, gather my gear, put on my hard hat and climb the hill. The place I am looking for is where the fire will come, where I can see the sky and observe the wind. My radio scans frequencies so that I hear all the conversations. In my mind’s eye, I know where everyone is and track their movements. Every half hour I measure temperature, relative humidity, wind speed and direction, fine dead fuel moisture. This information is relayed to the burn boss, but I know everyone else is listening to hear for themselves how the weather conditions will affect fire behavior. After awhile I see smoke, and report on its movement. The air grows warmer. Winds conflict over the ridge. The high temperature is 81 degrees, the low humidity is 20%. Events unfold and depart from the plan. This is normal. Humans are interacting with a natural process so we observe and adapt. There’s no drama, just response and teamwork. Lots of communication and reassessment. Decisions and action. Ignition stops in the middle of the day. The fire is held back in some places, and allowed to proceed in other places. I change my location to go watch a part that is advancing. My notebook fills with fire behavior observations. By late afternoon, things have calmed and ignition begins again. It’s almost midsummer and evening lingers. The burning goes well. The wind is in the fire’s favor, the temperature drops and the humidity rises. I watch from an open hillside as daylight drains away in the west. Swainson’s thrushes are calling and my heart lifts–this is the first I have heard them this year. A crescendo of robin chirps rises and falls as dark comes. I reach into my pack to find the headlamp so I can read the thermometer. A small owl starts up in the middle distance, a perfectly spaced steady tooting. I search for the memory…it’s either a Saw-whet or a Northern pygmy owl. Orange flames bloom across the hillside as the lighters find concentrations of slash. Smoke rises, lit from within. It’s quite beautiful. I can hear the crackling, and voices. I’m chilly but content. This is familiar, and I am part of it. At some time during the afternoon, I realized that I have been a wildland firefighter for 30 years. In the summer of 1982, I attended my initial firefighter training in Avery, Idaho. We watched old training films from the 1960s shown by a clattering projector in the back of a room in the warehouse. Our instructors used a blackboard and told stories. We were issued green Nomex pants and yellow fire shirts. In July, I went on my first fire. That fall, my crew helped with prescribed burning. Some years I haven’t gone on any fires, but I’ve always felt the responsibility to help. And the desire. A few years back, I realized I was not going to outgrow this fascination with fire. The smell of smoke wipes away those thirty years like they are nothing. My inner firedog is forever young. Sometimes I wake from intense dreams of being in a lookout. Or of chasing flames with a crew of friends. The sound of a Bell 206 helicopter reverberates deep within and memories come. Ignition finishes at ten minutes before midnight. 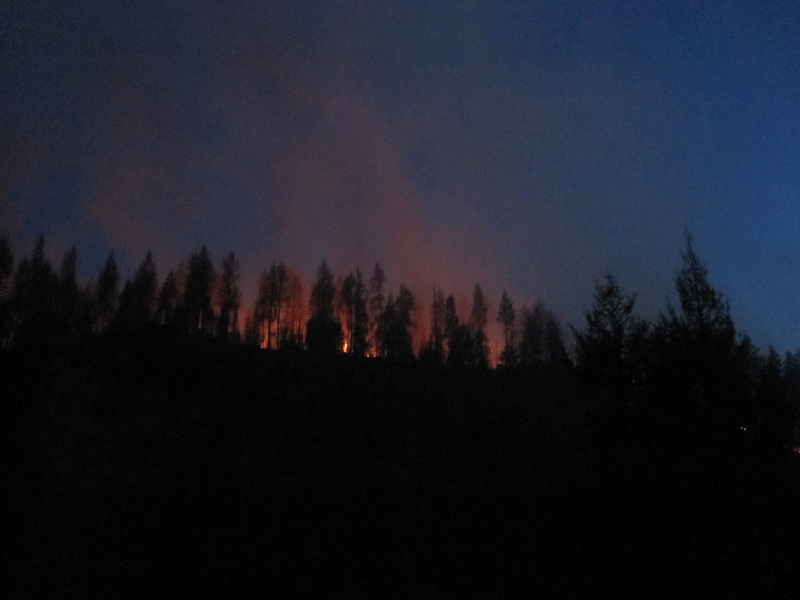 The fire will continue to back down the slope all night. Some people in fire engines will stay to watch. The rest of us pile in trucks to go home. I don’t quite know why, but reading this post brings tears to my eyes, moves me deeply. I’ve started to notice I read your blog slowly. That I hear your words spoken in my head, and notice I am voicing your prose aloud, savoring it. I enjoy the shape of your sentences, the rhythm of their sequence. There’s a sculptural quality to the way you shape and turn my attention to see this detail, then the next. You gracefully move me through my senses like a dancing partner guiding me through new steps, gently, skillfully and with such confidence that I relax, feeling, knowing, that I am in the arms of a master. And it’s all done with such economy. And is that why you move me? No, there’s more. You speak into my heart, I think, from all of you. You obviously speak with love. You speak from a stillness, I notice, that stills me, opens my attention, opens my heart. You speak an acceptance and appreciation for all you see and feel, and that soothes me, gentles me, and brings me to tears. Thank you. Wow. I’m glad you are able to come to the woods with me, glad you are able to find the stillness. And you are completely right about the love. Thanks for reading and responding.